Archaeologic In the early 1980s, civil servant Bernard Terry devised a 'portable text processor' to make his fellow civil servants more productive in the office and out. Electronics giant Thorn EMI designed the machine with help of a team of former Dragon Data engineers. 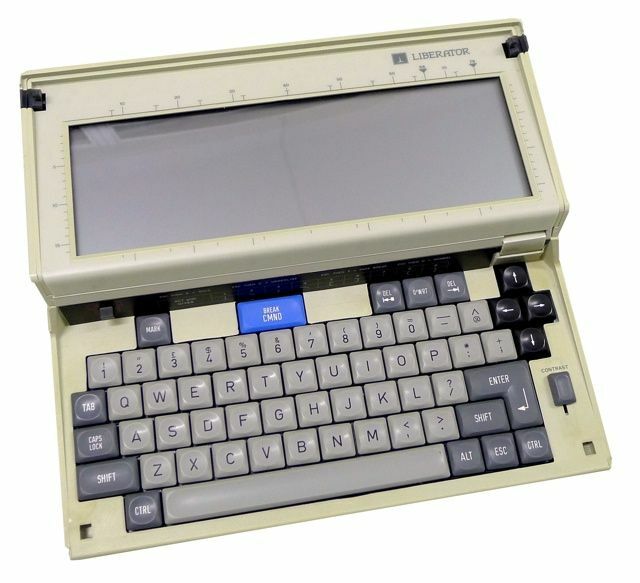 As the Liberator, it launched in September 1985 to become the first British laptop and beating the first PC-compatible laptop, Toshiba's T1100, to market. Read the earlier instalments of the Liberator story in Part One and Part Two. 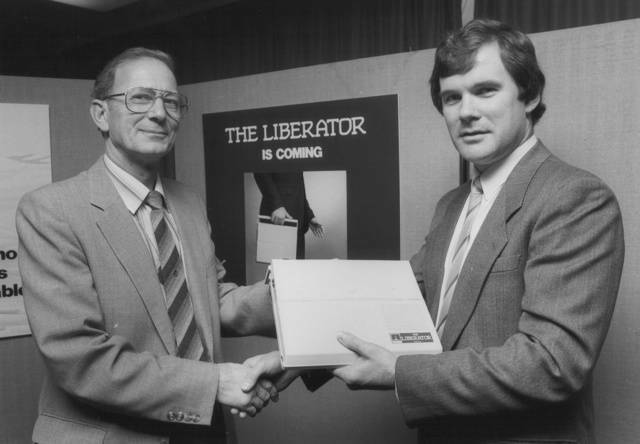 Responsibility for the selling the newly launched Thorn EMI Liberator to civil servants had been handed over to Her Majesty's Stationery Office (HMSO), the Civil Service's supply operation, in May 1985. Charged with selling the concept - and then the machine itself to Civil Service departments - was Reg Walker, then Assistant Director with HMSO's Supply Division, the group providing government workers with everything from word processors to photocopiers. 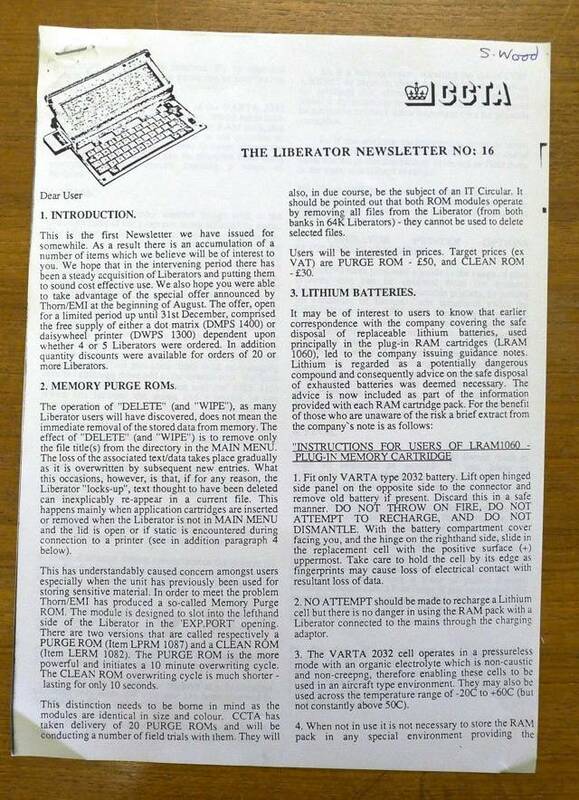 Already operating on internal market principles, HMSO sold the basic Liberator, the LPTP1001, for £567 excluding VAT and the more capacious, 64KB model for £639.45. On the open market, you could expect to pay £755 for the 40KB model, or £847 for the higher-capacity version. Office politics played a part too - ironically, since the Liberator had been designed to sidestep such issues. “It was felt by some that senior executives should be using their brains to solve problems, not type things; that was for the lowly typist,” recalls Walker. Many people did buy Liberators, he remembers, just nowhere near the numbers forecast. Those who did place orders were generally impressed. “One of our accountants loved the thing, and he reckoned it was better than many of the things that came after because it was simple, it did just what you wanted: it processed your text and you didn’t have to bugger about too much with it,” Walker remembers. To prove the point, David Bothwell, a Senior Advisory Officer with Hampshire County Council, wrote his September 1986 review of the Liberator for the Local Government Chronicle on the Winchester-London train. Bothwell had first encountered the Liberator in the hands of one of a group school inspectors he met earlier that year. "School inspectors travel a great deal, and when one of them told me that with a Liberator he was able to work efficiently on a train for the first time, I decided it was a machine my colleagues and myself ought to test," he wrote. The result: "20 advisers in Hampshire's education department use a Liberator as a working tool... 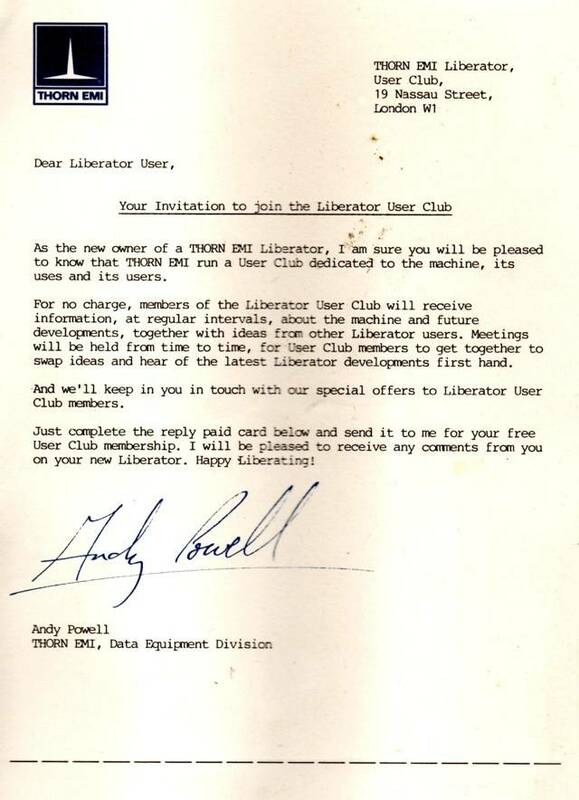 Even my most untechnologically minded colleagues seem to have no difficulty mastering the Liberator after, at most, an hour's training or self-tuition from the straightforward user manual." Dr Andrew Craig, then the Principal Administrator at the Royal College of Nursing, heaped even more praise on the Liberator. Writing in the Independent Health Service Yearbook, he lauded how the machine, "as the Americans say, helps me 'shovel a lot more words a lot more quickly'... What the Liberator does is enable me to miss out an entire step in the document creation process". Handy, that, for someone who had to "capture large amounts of text daily... I gave the Liberator a baptism of fire at the recent Royal College of Nursing annual conference in Blackpool. This involved my having to make a highly accurate record of a series of meetings attended by about 1500 people. Since I was seated on the stage at the time, I couldn't use any word processing device that made a noise. The Liberator came through the conference with flying colours". No wonder he told fellow senior healthcare administrators: "I can recommend the Liberator... with all my heart."